Disasters are increasing at local, national, and global levels, as is the need for all nurses and communities to be prepared. Since 2003, decreased funds for disaster preparedness has meant less opportunity for public health departments and emergency management agencies to test disaster response plans. Today’s graduating nurses need strong skills in disaster nursing to manage a variety of disasters in a local to global context. One aim of this article is to briefly describe preparedness planning using a Point of Distribution/Dispensation (POD) and teaching competencies for disaster nursing. We discuss in detail an exemplar about a simulation developed with collaboration among university faculty, the county public health department, and the local emergency management agency (EMA). The article considers insufficient funds for drills and exercises; strategies to increase disaster knowledge and competency of undergraduate nursing students; and realistic, hands-on active learning approaches to disaster response at all levels, including implications for practice. Citation: Rafferty-Semon, P., Jarzembak, J., Shanholtzer, J., (January 31, 2017) "Simulating Complex Community Disaster Preparedness: Collaboration for Point of Distribution" OJIN: The Online Journal of Issues in Nursing Vol. 22, No. 1, Manuscript 3. Annually, 255 million people are impacted by disasters globally... All types of disasters, whether natural or man-made, are on the rise and pose a threat to public health. Annually, 255 million people are impacted by disasters globally, and 62,000 people per year die as a result of large-scale, global disasters (Putra, Kep, Petpichetchian, & Maneewat, 2011). Disasters are unpredictable and can occur at any given moment, so preparedness is crucial. To achieve the appropriate competency necessary to support disaster preparedness, public health nurses need opportunities to train and test disaster responses. Conducting exercises to prepare for various disaster scenarios is imperative to the safety of the community. However, planning for disastrous events is costly and time-consuming, so preparedness drills are often not conducted as frequently as necessary, especially with recent reductions in disaster planning funding (Schlegelmilch, Petkova, & Redlener, 2015). With reductions in preparedness funding, there exists the potential for serious consequences to our national disaster infrastructure. In lesser developed countries, with even less funding, the struggle for disaster preparedness response is greater. To be effective in times of disaster, community-level PODs must be predetermined related to location, supplies, implementation, and access. One common way that disaster management personnel respond to disastrous events is through the employment of a Point of Distribution or Point of Dispensation (POD). The POD system utilizes an accessible, centralized location where the general public is able to obtain specifically determined emergency supplies such as food, water, and/or prophylactic medications following a disaster. To be effective in times of disaster, community-level PODs must be predetermined related to location, supplies, implementation, and access. However, there are almost no descriptions in the literature about simulation or testing of POD systems that provide guidelines for public health nursing. ...many nurses travel response to global level disasters. Nurses comprise the majority of healthcare providers around the world and thus have a critical role in the management of disaster response (World Health Organization, 2006; as cited in Putra et al., 2011). Nurses can bring unique skill sets to manage emergency situations, including proper assessment, priority recognition, communication, and collaboration skills. Competency in these skills allows nurses to make accurate, life-altering decisions in highly emergent and demanding situations. In addition to disaster response in the United States, many nurses travel to response to global-level disasters. Nurse educators, nursing students, and public health nurses must develop and refine skills to ensure competency when disaster occurs. Today’s graduating nurses need strong skills in disaster nursing to manage a variety of disasters in a local to global context. One aim of this article is to briefly describe preparedness planning using the POD concept, teaching competencies for disaster nursing, and the importance of partnerships and collaboration toward its effective implementation. We discuss in detail an exemplar about a simulation developed with collaboration among university faculty, the county public health department, and the local emergency management agency (EMA). The exemplar describes a cost-effective way to simulate disaster preparedness by partnering nursing programs with local county health departments, thereby testing community response systems and training pre-licensure nurses for low-occurrence, yet high-risk events. The article considers insufficient funds for drills and exercises; strategies to increase disaster knowledge and competency of undergraduate nursing students; and realistic, hands-on active learning approaches to disaster response at all levels, including implications for practice. POD plans are developed by local health departments in coordination with the United States (U.S.) Department of Homeland Security Federal Emergency Management Agency (FEMA). Together these agencies develop the POD plan, including the location, staffing needs to deploy the system, and specific commodities to be distributed (Harkness & DeMarco, 2016). Agencies develop training programs to assist public health personnel to maintain competency related to the POD system, and specifically in the activation in the event of a disaster (Harkness & DeMarco, 2016). In the United States (U.S.), post-9/11 disaster preparedness funding has come from Public Health Emergency Preparedness (PHEP) cooperative agreements and the Hospital Preparedness Program (HPP) (Schlegelmilch et al., 2015). These grants are funded through the U.S. Department of Health and Human Services, with PHEP funds being distributed by the U.S. Centers for Disease Control and Prevention (CDC). Funding aims are to ensure proper disaster response while helping to prepare the medical workforce to develop and properly deploy plans when needed (Levi, Segal, Gougelet, & Laurent, 2015; Schlegelmilch et al., 2015). These funding streams help disaster planners test response rates and ensure workforce training to handle complex procedures and equipment required, typically through high-fidelity drills or simulation (Schlegelmilch et al., 2015). However, funding for these agencies has been reduced by more than 50% since it peaked in 2003 (Levi et al., 2015). More alarming is that funding has been cut by more than 30% in the past year (Schlegelmilch et al., 2015). As a result of decreased federal funding, agencies need to develop cost-effective ways to test disaster preparedness plans to ensure readiness when deployed. ...the need for disaster preparedness and response competencies that include practice is critical no matter the context. While this briefly summarizes the use of the POD concept and its major challenges in the United States, it is important to consider that frequently, it is healthcare providers and agencies (e.g., U.S. military, American Red Cross) from the U.S. and other developed countries who primarily respond to global-level disasters. While funding streams to support these responses are different, the need for disaster preparedness and response competencies that include practice is critical no matter the context. Nurses need special training to serve in disasters, and undergraduate education is the most ideal place to increase the exposure of nursing students to emergency preparedness. Nurse educators are in the best position to provide disaster preparedness training at the undergraduate level for nursing students (Hassmiller, 2015). Therefore, it is important for undergraduate faculty to be prepared to teach disaster preparedness, response, and recovery. Faculty also typically have appropriate skills to reach out to individuals in the community involved in disaster and recovery; understand and become aware of emergency disaster plans in the workplace and community; and foster interprofessional collaboration with paramedics; law enforcement personnel; leaders at shelters, food banks and hospitals; public health departments; city council members; and other community partners (Hassmiller, 2015). Through these exposures, prelicensure students will understand the complex nature of disaster response planning and the competencies needed for a successful response. Nurse educators must provide nursing students with competencies that include promoting and sustaining the health of the community during mass casualty incidents and natural or man-made disasters. Education to achieve these competencies helps students learn about how to function during phases of disaster preparedness, response, and recovery (Shannon, 2015). There is increased demand for content related to principles of disaster nursing and nursing roles. There is increased demand for content related to principles of disaster nursing and nursing roles. However, widespread adoption of a disaster curriculum is lacking in most schools. Although Shannon (2015) reported that student experiences in disaster nursing are increasingly varied in the content, concepts, and chosen competencies (Shannon, 2015). Nurse educators have traditionally used the classroom setting (case studies, classroom discussion, and objective testing) to deliver disaster and emergency preparedness content to their undergraduate students (Kuntz, Frable, Qureshi, & Strong, 2008). Current recommendations are to provide students with active learning methods which provide opportunities for hands-on, realistic exposure to disaster response (Cook, Grube, Skalacki, & Nazir, 2013; Farra, Miller, & Hodgson, 2013). Learning experiences for disaster and emergency preparedness training include simulation, inter-professional education (IPE), online gaming, and virtual reality (Farra et al., 2013; Haferkamp, Kraemer, Linehan, & Schembri, 2011; Rega & Fink, 2013). One effective active learning approach can be simulation. Simulation is a structured activity that represents an actual or potential situation. The practice of simulation helps students develop needed knowledge, skills, and attitudes and provides them with opportunities to analyze and respond to realistic situations (Pilcher et al., 2012). Hayden (2010) found that simulation is used in 87% of prelicensure programs, most frequently in foundations, medical-surgical, obstetric, and pediatric courses. However, simulation may also provide effective learning opportunities for community health nursing (Distelhorst & Wyss, 2013). More realistic scenarios expand the role of the individual nurse by incorporating collaboration among key partners. Community health nursing simulations may include home care of individuals, care of the community as a population, emergency response, or disaster response (Alfred et al., 2014; Distelhorst & Wyss, 2013; Schmidt et al., 2011). In addition to the safe learning opportunity provided by simulation, it is also useful for content that cannot easily be replicated in clinical settings (Giddens et al., 2008), such as disaster and emergency response experiences. Simulation also allows nurse educators to transform disaster and emergency response nursing from a theoretical or hypothetical situation to a more realistic scenario (Stanley & Wolanski, 2015). More realistic scenarios expand the role of the individual nurse by incorporating collaboration among key partners. Benefits of providing disaster preparedness education to nursing students have been widely acknowledged. One strategy to ensure the provision of this critical training is to pair nurse educators and students with well-established community response units (Schmidt et al., 2011). Such a partnership with colleges of nursing offers an important benefit to the county response team who can then effectively evaluate and revise POD plans for disaster preparedness. Partnerships between response units and colleges of nursing also potentially bring awareness to the overarching goal of public health nurses to promote community safety and health. Lastly, this collaboration can increase student awareness about volunteering for the Medical Reserve Corps (MRC). This is a long-term benefit to the county health department and EMA because MRC volunteers comprise the majority of staff required to run a POD. Despite benefits to both nursing students and partnering community agencies, there is minimal published information describing such partnerships or offering guidelines to execute collaborative disaster simulation drills. In the next section, we describe an actual partnership between a university college of nursing, the county public health department, and the county EMA. The description discusses the concept of just-in-time training, specifics related to our logic model (e.g., actual activities, outcomes), and lessons learned. This exemplar discusses a simulated POD disaster exercise designed to achieve a dual purpose: to expose and educate nursing students on skills needed for participation in a disaster response and to allow county emergency response personnel to test existing systems for effectiveness with complex, widespread bioterrorist or emergency events that create high levels of uncertainty. Collaboration for preparedness between the college of nursing, the county public health department, and the county EMA offers an effective strategy to achieve mutual benefits to promote the safety and health of community members during a disaster-level emergency. Just-in-time training represents a critical component to the success of the POD plan. Just-in-time training represents a critical component to the success of the POD plan. A trained public health nurse teaches the skills needed to run the POD station to novice nurse volunteers immediately before they are to begin utilizing the resources. The rationale for this timing is to use the least amount of resources and maximize public health experts’ knowledge to manage the disaster response (Harkness & DeMarco). This interdisciplinary and interprofessional simulation placed nursing students in MRC roles to test the actual POD centers, enabling the county response team to effectively evaluate and revise this aspect of disaster preparedness. Simultaneously, nursing students were exposed to real-life management roles of public health team members during a bioterrorist event/response, allowing them to transition disaster preparedness theory into practice. Public health department staff and members of the emergency management agency (EMA) were able to evaluate their just-in-time training (JITT) skills when training nursing students to function at each station of the POD. In the simulation, students had a short period of time to obtain necessary information (located on Job Action Sheets) and skills needed to operate the POD response system. The success of the response was based on how well the information was conveyed by public health staff, utilizing just-in-time training, to novice nurse volunteers at each of the POD stations. Public health staff was able to use this formative assessment to evaluate their just-in-time training in real time, allowing for revision and improvement in the quality of the disaster response. Effective disaster preparation requires an interdisciplinary and interprofessional approach. Effective disaster preparation requires an interdisciplinary and interprofessional approach. Communication and collaboration between many agencies and organizations is essential. Focusing on community-level disaster preparation requires considerable complexity, given the many people, agencies, and needs involved in a response. The disaster simulation used in this exemplar, a bioterrorism attack, created a highly complex situation with widespread impact and great uncertainty. In this scenario, college of nursing students partnered with the local public health department and EMA to practice disaster preparedness exercises. The goal was to prepare the county for various potential disasters that could impact a very large population group or community. We used a logic model framework to plan the sequence and timeframe for implementation of the disaster simulation. A logic model is a visual representation in the form of a process map or flow diagram of the logic behind the operation of a program. It is used as a tool for both planning and communication to identify available and needed resources, plan the timeframe for program implementation, develop a budget, and identify how results of the program will be measured (Harkness & DeMarco, 2016). We provided a visual representation of the overall program operation to help organize its many components: target population who will receive services; simulation activities (what will be done during the drill); the timeline (when each activity will occur); the place (where the simulated disaster will unfold); and the why, or reasoning behind decisions made (Harkness & DeMarco, 2016). 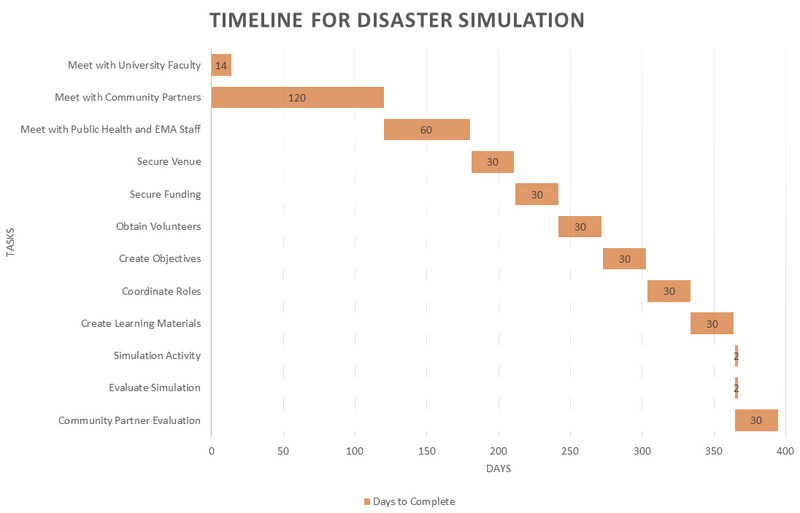 See the figure for more detail about the timeline to develop and implement our collaborative disaster simulation. Inputs/resources and constraints, activities, outputs, and outcomes were all taken into consideration when utilizing this logic model (Harkness & DeMarco, 2016). ...meetings with university fire and police chiefs and other first responders helped us to better understand their roles in disaster response. Inputs/resources and constraints. During the planning phase, we first considered inputs, or resources necessary to develop and implement the disaster simulation. Community health nursing and nursing simulation faculty met to discuss a disaster simulation for nursing students and agreed upon the following overall goals: to increase nursing student knowledge, skills, and confidence to prepare for and respond to a community disaster using a real-life scenario; to encourage students to join the MRC as volunteers after graduation; and to improve preparation for disaster response in the future. Subsequent meetings with university fire and police chiefs and other first responders helped us to better understand their roles in disaster response. Nursing faculty considered how they could simulate a mass casualty disaster scenario within the limited space and resources available at the college of nursing simulation lab. ...participants decided that the most likely role of a public health nurse responding to a disaster would be installation and management of a POD site... As planning continued, college of nursing faculty and nurses from the county public health department and EMA met at their respective facilities to learn about plans for disaster management and resources available for inclusion in the disaster simulation. After much discussion, county public health department and EMA participants decided that the most likely role of a public health nurse responding to a disaster would be installation and management of a POD site to distribute life-saving antibiotics to victims of a bioterrorist attack. Constraints identified during the planning process included securing a venue large enough to implement the simulation; funding the venue; finding sufficient volunteers to assist; and communicating and collaborating effectively to ensure that all participants shared a common goal. Activities. We also used a logic model framework to consider activities (e.g., processes, tools, events, and actions to bring about the program’s intended results). For example, the college of nursing needed a venue large enough to accommodate the needs of the disaster simulation. A multidisciplinary collaboration and partnership required a location with the capacity to house 50-60 nursing students, nursing faculty, health department and EMA staff, and volunteers from the university community who served as victims in the disaster scenario. In the three years since the initial implementation, simulations have been held in churches, an indoor athletic training facility field house, and at the student recreation and wellness center (SRWC). The SRWC was the most ideal setting due to its on-campus location, ample parking, adequate space, and availability at no cost. Drama students were assets to the simulation because they can engage in real-life acting. Drama students were assets to the simulation because they can engage in real-life acting. Thus, we secured grant funds to pay two theater students as actors two days per semester. Students introduced panicked victims and unpredictable reactions which occur during disastrous events. This provided realism and the element of surprise to the disaster scenario. Payment for theater students/role players comprised most of the disaster simulation budget. In addition to theater students, we emailed all faculty, students, and staff to recruit additional volunteer victims. Volunteer victims added realism to the disaster scenario, encouraging simulation partners to think quickly and strategically. For example, a public health student spoke Mandarin Chinese and role-played various situations as a non-English speaking victim going through the POD stations. To prepare for the simulation, nursing students read about preparing for disasters; viewed a lecture module in environmental health and disaster preparedness; presented a clinical conference on preparing for disasters; and reviewed forms they would utilize during the simulation. They were required to view two YouTube videos about using POD sites during mass dispensation exercises. Exposing students to this information in advance helped them differentiate and describe an intentional biological attack from a natural disease outbreak, one learning objective for the simulation. Disaster simulation planning also included coordination of roles... to meet the simulation goals. Disaster simulation planning also included coordination of roles for nursing students, faculty, and health department and EMA staff to meet the simulation goals. Simulation faculty organized and managed volunteer victims, assigning roles and designated time slots. They provided props for volunteers (e.g., wheelchairs, canes, crutches, infant manikin) to make the scenario more realistic. Community health nursing faculty moved through the five POD stations with their assigned clinical groups. This helped them to evaluate students as they demonstrated new skills and knowledge obtained with just-in-time training from health department staff. Nursing faculty actively participated in the scenario to meet learning objectives of the simulation. All students rotated through each POD station, which included triage, medication review, medication administration, exit/education, and role playing as a victim of a possible anthrax exposure. Health department staff provided a briefing for the students via a PowerPoint presentation which introduced information about the structure of the Incident Command System, anthrax, historical information about disasters, and the scenario. They were also in charge of providing just-in-time training to nursing students; answering questions; assisting students at stations to confidently perform their duties, and presiding over debriefing or “hot wash” post-simulation evaluation sessions. Staff also provided signs, pens, forms, Job Action Sheets, learning materials, educational materials, and different-colored vests to differentiate roles played in the Incident Command System during the drill. Their logistics crew set up tables, chairs, and any other items necessary to establish the POD. EMA staff evaluated execution of the drill to improve future disaster exercises. Outputs. Outputs are the direct products of program activities. In the disaster simulation, the products included the number of nursing students who obtained knowledge, skills, and confidence to competently function in a POD simulation with assistance from public health department staff. During the last three years, over 120 students each semester have engaged in this joint partnership simulation to increase their competency in disaster nursing. Lessons included the psychological impacts of a disaster on individuals, families, and the community and safe administration of medication. This collaborative effort between the college of nursing and health agency partners used an interdisciplinary approach to allow students to assess community action plans. Public health staff and nursing faculty taught students to assess safety issues for themselves, the response team, and victims in general during the simulated disaster. Lessons included the psychological impacts of a disaster on individuals, families, and the community and safe administration of medication. Students practiced nursing interventions needed in a disaster event, such as identifying reactions to fear, panic, and stress that victims, families, and responders may exhibit during a disaster event. Public health staff also helped students learn to maintain security and confidentiality during a disaster event while adhering to ethical and nationally approved frameworks supporting decision-making and prioritizing. ...the collaborative partnership allowed the county public health department and EMA staff to practice and test the effectiveness of the POD exercise and make changes as needed. In addition to benefiting students, the collaborative partnership allowed the county public health department and EMA staff to practice and test the effectiveness of the POD exercise and make changes as needed. There were over 20 public health and EMA staff in attendance for each simulated event. Nursing faculty ensured that students applied critical thinking skills (i.e., were they viewing the bigger picture?) to contend with unique situations that would occur at the various stations while they interacted with health department staff, received just-in-time training, and interacted with the victims at stations. The public health department and EMA had trained evaluators present during the simulation to evaluate the effectiveness of the disaster plan. Outcomes. Outcomes are expected changes resulting from program activities. They can be short-term, medium-term, and/or long-term. Program outcomes included improved efficiency and effectiveness of the POD response plan; increased knowledge, skills, and confidence by nursing students when responding to the POD simulation; increased willingness of nursing students to join the MRC; and increased preparedness of nurses when responding to future disasters. The public health department and EMA had trained evaluators present during the simulation to evaluate the effectiveness of the disaster plan. Evaluators participated as patrons during the simulation activity, allowing them to experience the disaster simulation and provide feedback to nursing students and emergency agencies at the conclusion of the event. To evaluate the simulation as an educational strategy, nursing faculty developed a tool to inform changes for the next semester. After the debriefing session, nursing students completed a structured, 8-item post disaster simulation evaluation form with questions related to meeting the learning objectives. Students also answered two open-ended questions to provide suggestions about how to improve the experience and to identify three strengths and three areas for improvement of the disaster exercise. Nursing faculty observed and evaluated the disaster simulation, then met briefly with agency members and other faculty to discuss whether or not student learning objectives were met in an interdisciplinary manner. Suggestions for improvement included hiring more theater students and recruiting more people from the community to make the scenario more realistic; limiting students to role-playing the public health nurse (and not a patron); and shortening the time for the exercise. Faculty also evaluated student results following the standardized predictive test that includes specific disaster preparedness content as preparation for the nursing licensure exam. Nursing faculty have since developed a disaster simulation worksheet to help students reflect on the value of knowledge and skills learned at each station. These are completed immediately after participating in a particular station. College of nursing faculty and participants from the county health agencies also convene post simulation to reflect on the experience and evaluate whether each entity met objectives. This ongoing, collaborative simulation experience has evolved over the past three years. Several lessons we have learned have provided opportunities for continuous improvement. One valuable lesson learned is to start small. Keep it manageable. One valuable lesson learned is to start small. Initially, we considered involving many disaster response community partners. Numerous partners involve complex logistical plans, making replication an even greater challenge. Careful planning of the objectives for nursing students revealed that the public health nurse response did not include an elaborate disaster scene. Carefully consider venues. Another lesson learned was to have buy-in from partners. In one planned event, we secured the actual location for our local county POD; however, the venue continued normal day-to-day operations, prohibiting an ideal simulation environment. Acoustics for large group announcements and participation was also better at some locations than others. Parking for county trailers containing equipment and general parking for all participants may also present a logistical issue. Negotiating appropriately sized and realistic spaces for the amount of equipment and all participants which are still financially viable are take-home points from these lessons. Careful announcement and signage depicting the event as a drill must be considered to avoid widespread panic. Announce upcoming drills. Careful announcement and signage depicting the event as a drill must be considered to avoid widespread panic. Current news and media stories of bioterrorism or epidemics may result in heightened alarm. As an example, our disaster simulation was almost cancelled during an Ebola scare in our area. Alerting administrative personnel and local emergency response groups to ensure awareness can help alleviate undue public concern. Seek ongoing improvements. As students simulate MRC volunteers and victims, effective improvement to county and EMA response procedures have occurred. Examples include improvements for working with victims who do not speak English and improving clarity of directions and forms needed at the PODs. Skills acquired via local and regional drills may even be transferable should nurses participate in a global response to an emerging disaster. Implications and recommendations for practice resulting from our partnership may benefit nursing programs and communities nationally and globally. Potential disasters are not limited to specific geographical locations, but rather exist for all on a global level. Many countries have at least some type of disaster response in place. Collaborative simulation among nursing schools and local disaster response teams can be repeated with minimal cost to prepare disaster response teams and educate future nurses virtually anywhere. In the United States, the modifiable POD has been developed with the purpose of quickly aiding communities experiencing broad scale events, such as a mass vaccination for the H1N1 virus. Nationally, the POD system can be tested to increase efficiency using this simulation model. Skills acquired via local and regional drills may even be transferable should nurses participate in a global response to an emerging disaster. A 2011 Institute of Medicine Report recommends that nurses assume more leadership roles. Nursing students may gain important practice with leadership roles and learn specific competencies as related to disaster preparedness through creative methods integrated into nursing curricula, and creative partnerships with community entities. Pamela Rafferty-Semon is a lecturer at Kent State University College of Nursing in Kent, OH. She has taught and served as the disaster simulation coordinator for the senior-level community health nursing course. Pamela obtained a BSN degree at the Ohio State University in Columbus, OH; a MSN with a concentration in Health Care Education degree at the University of Phoenix in AZ; and is pursuing a Doctor of Philosophy degree in Health Education and Promotion at Kent State. She attended the National Disaster Health Consortium at Wright State University in Dayton, OH in April 2015 and became certified Basic Disaster Life Support (BDLS) and Advanced Disaster Life Support (ADLS). She has led several initiatives and received grant funds to create partnerships to prepare communities for disasters. Pamela has worked as a hospital nurse, community health nurse, and nurse educator for over 26 years. Jeremy Jarzembak is a senior lecturer at Kent State University College of Nursing in Kent, OH. He earned a Master’s degree from Kent State University in exercise physiology and a BSN from Cleveland State University. Jeremy is currently pursuing a doctorate in health informatics. Jeremy has 13 years of intensive care nursing experience. In addition to teaching nursing informatics at both the undergraduate and graduate level, he helps to design, operate, and program simulations for the college. He has also secured several funding opportunities to enhance the simulation experience for students at Kent State. Jennifer Shanholtzer is Simulation Lab Coordinator and lecturer for Kent State University College of Nursing in Kent, OH. She obtained a Master’s degree in the science of nursing education at Kent State University and a BSN from Ursuline College. Jennifer’s background includes 14 years as a registered nurse in high-risk obstetrical nursing. A full-time faculty member at Kent State, she has increased use of simulation to include every undergraduate nursing course and some graduate courses. Highlights of these improvements include a disaster simulation working with a local county emergency response team; integration of theatre department student actors as standardized patients; development of simulation scenarios; creation of an electronic medication scanning system; and grant-funded simulation lab improvements. She has presented on the topics of theatre students in simulation, interdisciplinary care of patients at end of life, and collaboration between higher learning institutions. Cook, D. J., Grube, C. D., Skalacki, M., & Nazir, N. (2013). Long-term impact of training following disaster response exercises. Homeland Security Review, 7(3), pp. 253-263. Harkness, G. A., & DeMarco, R. F. (2016). Community and public health nursing: Evidence for practice (2nd ed.). New York, NY: Lippincott Williams & Wilkins. Hassmiller, S. B. (2015). Foreword. In S. Stanley & T. Wolanski (Eds. ), Designing and integrating a disaster preparedness curriculum: Readying nurses for the worst. Indianapolis, IN: Sigma Theta Tau International. Institute of Medicine (U.S.). Committee on the Robert Wood Johnson Foundation Initiative on the Future of Nursing. (2011). The future of nursing: Leading change, advancing health. Washington, D.C.: The National Academies Press. Levi, J., Segal, L. M., Gougelet, R., & Laurent, R. (2015). Issue report: Investing in America’s health: A state-by-state look at public health funding and key health facts. Trust for America’s Health, Issue Report from the Robert Woods Johnson Foundation, Washington D.C.
Schlegelmilch, J., Petkova, E., & Redlener. (2015). Disaster prepared: How federal funding in the USA supports health systems and public health readiness. Journal of Business Continuity & Emergency Planning, 9(2), p.112-118. Schmidt, C. K., Davis, J. M., Sanders, J. L., Chapman, L. A., Cisco, M. C., & Hady, A. R. (2011). Exploring nursing students' level of preparedness for disaster response. Nursing Education Perspectives, 32(6), 380. Shannon, C. C. (2015). Pouring the foundation. In S. Stanley & T. Wolanski (Eds.). Designing and integrating a disaster preparedness curriculum: Readying nurses for the worst. (p. 1-34). Indianapolis, IN: Sigma Theta Tau International. Stanley, S. A. R., & Bennecoff Wolanski, T. A. (2015). Designing and integrating a disaster preparedness curriculum: Readying nurses for the worst. Indianapolis, IN: Sigma Theta Tau International.